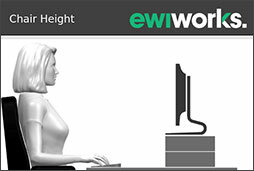 The office ergonomics training and the self-adjustment tool combined into one package. A synergistic combination of office ergonomics training and self-adjustment. The added self-adjustment enables the trained user to correctly adjust their workstation and identifies whether there is a need for a professional assessment. Some minor equipment and furniture may also be recommended for improved comfort. For example, in some cases a footrest may be recommended. 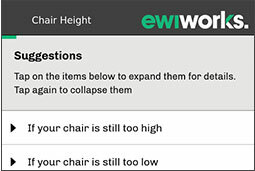 For most people with reasonably adjustable workstations, the training and self-adjustment will be sufficient. This proactive and educational approach promotes efficient use of resources and identifies potential issues before discomfort develops.